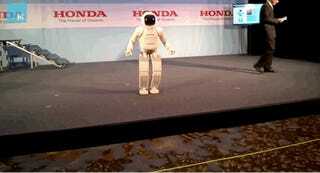 Honda's humanoid robot, ASIMO, recently celebrated its 14th birthday. The diminutive android has experienced some minor upgrades over the years, but nothing quite like it's latest batch of enhancements. Just watch what ASIMO can do now. The first thing that struck me was the human-like way ASIMO can now move; it can run quite elegantly at a speed of 3 mph. The new version is much lighter and a little-bit smaller than its predecessor which gives it that added agility. In addition, ASIMO can pick up a sealed container filled with juice, unscrew the top, pick up a cup with its hand, pour the juice, and carefully set both items back on the table. Writing in an accompanying Mashable article, Ulanoff explains that ASIMO uses a great number of sensors, including its two camera eyes and the sensors in its hands. These tell the robot that it's holding something, what kind of object it is, and how much it weighs.